Our local farmer’s market has a mushroom vendor with the most beautiful shiitakes, oyster, morel and porcini mushrooms imaginable. Each week, this stall is my first stop before winding my way through the bounty of gorgeous produce. Garlic spears happened to be in season when I made this soup so I incorporated them into the recipe; garlic scapes would work nicely as would scallions. 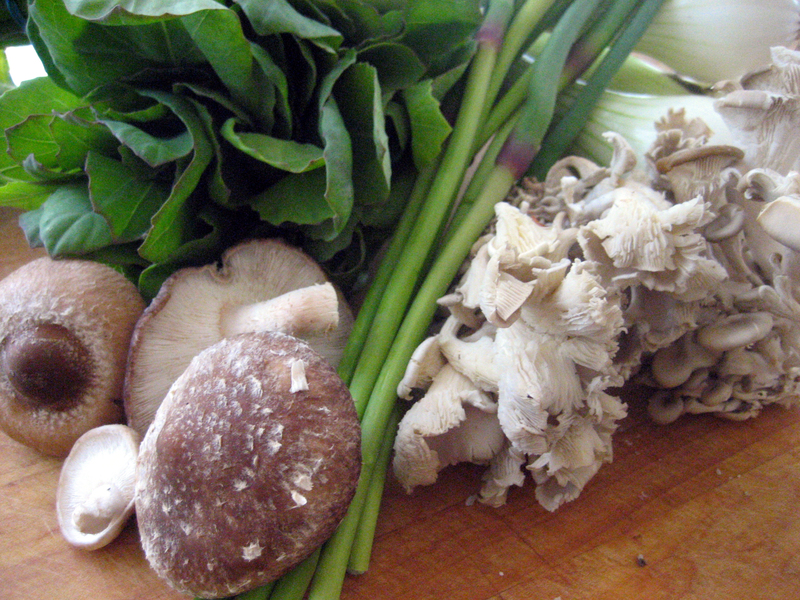 Sauté the mushrooms and onions in a bit of neutral oil until they have softened. Add 2/3 of the garlic spears [or sliced garlic and scallions] and cook for a couple of minutes longer. 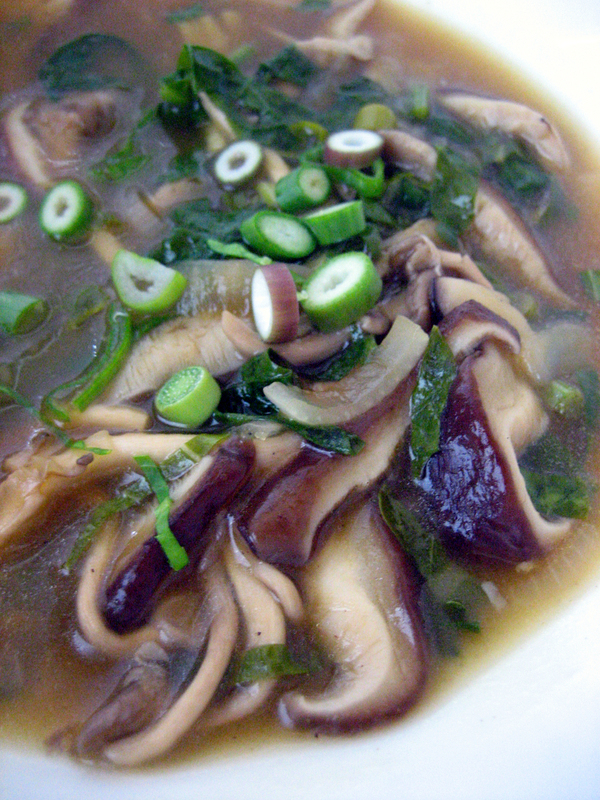 Add in the No Chicken Broth, tamari, red wine vinegar and pepper. Stir well and bring to a low simmer. Slowly add in the cornstarch while mixing and bring back to a simmer. Once thickened, toss in the greens and cover the pot. Cook until the greens are tender. Serve while hot. Garnish with the remaining garlic spears or scallion slices. that looks like the Olympia Farmer’s Market! Am i right? And this recipe sounds delish – definitely can’t wait to try it! Sheila, you have a good eye! 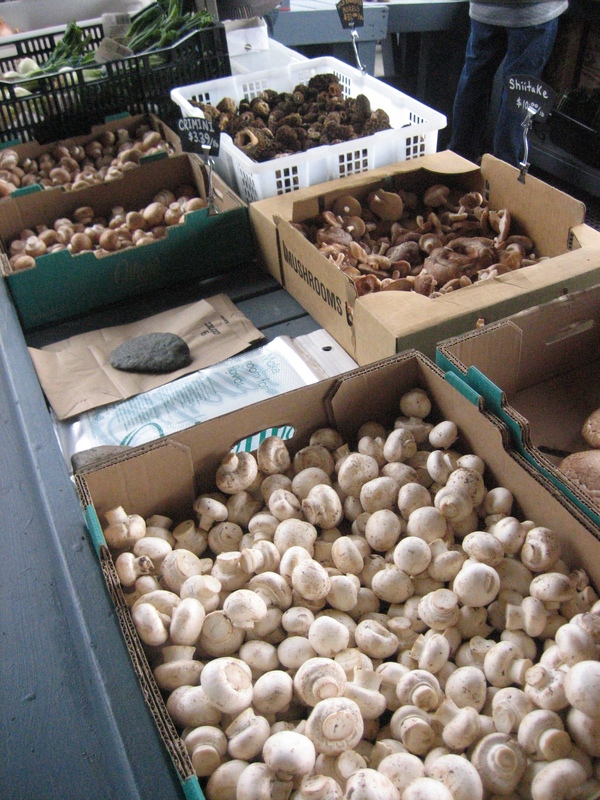 It is the Olympia Farmer’s Market and the mushroom stand is The Fresh Approach.